Bye Bye Summer or Hello Next Getaway - Fashionomics "every page"
Well it always happens. I wait for summer and the freedom to be off the grid and plan for family trips and fun dinners out and longer days (not the heat) and then it’s gone just like that. This is my tribute to white pants, sandals and vacations!! 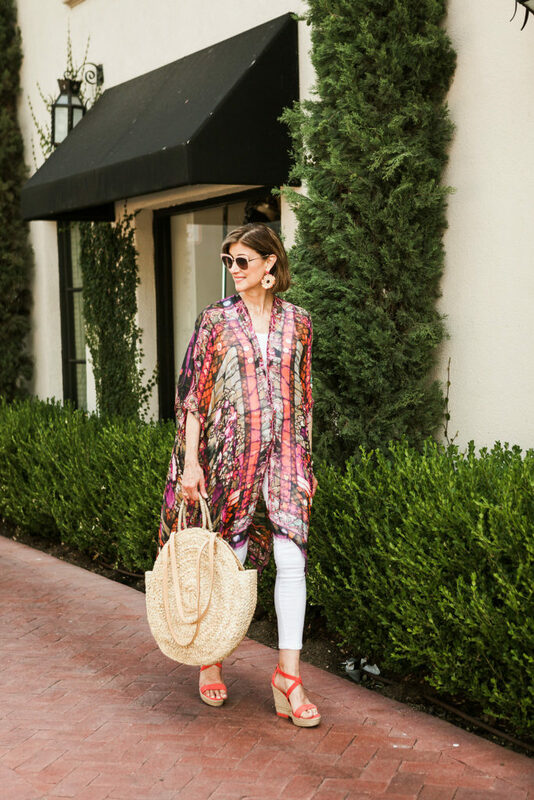 However – you might be planning a winter trip to Hawaii or Mexico and this outfit would work for you!! Anyway, I hope your summer was fun and we can look forward to the leaves changing (sooner or later) and football (yay!!) and the State Fair of Texas. So, I guess it’s not too bad. My husband goes hunting on Labor Day (always!!!!) and I usually go to Connecticut but since we were just there I may head to Austin to hang out with V!! What are your planning for this farewell holiday!! 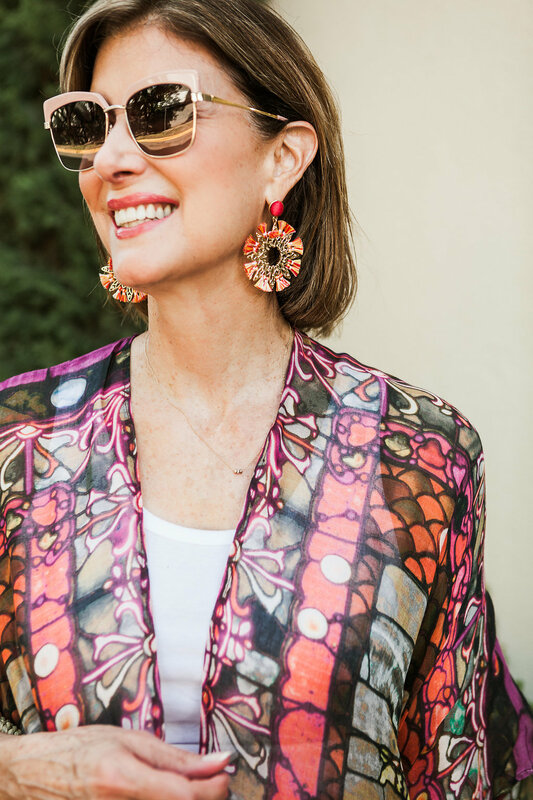 I just had to show you this beautiful stained glass kimono from Elizabeth Gillett. It is such and easy third piece to bring in some color and would also be the best swimsuit cover up ever. You know I love her things and always enjoy wearing them. 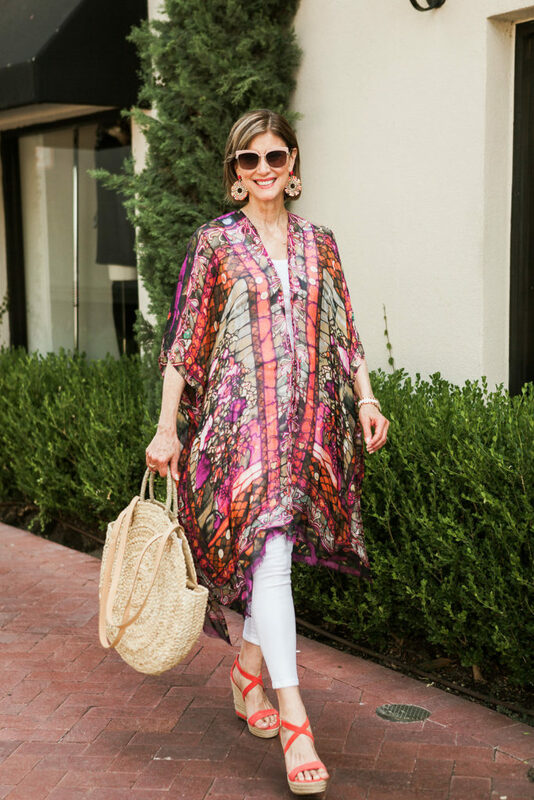 You may remember another kimono from this blog post recently. I wore it in Mexico and was brave enough to post myself in a swimsuit on social media!! Yikes!! A kimono is just a fun piece to have in your wardrobe. 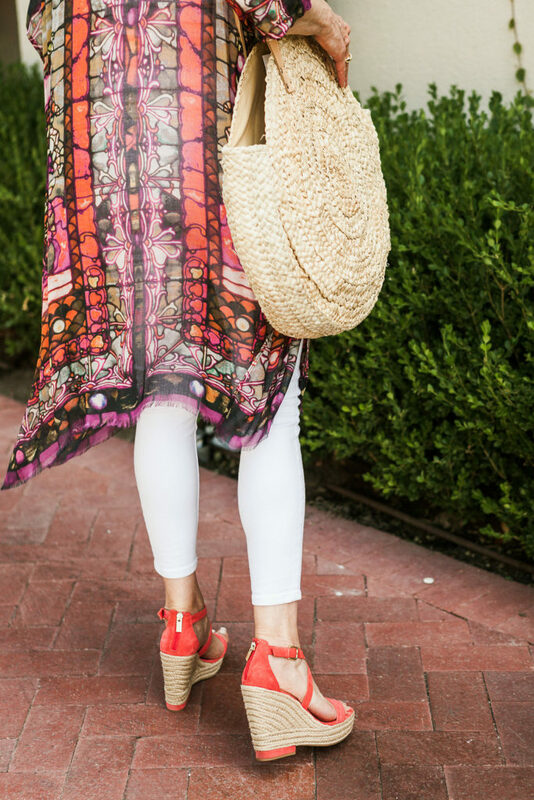 It is really timeless and great for wearing on vacay or on a dinner date. I always love the beautiful patterns and colors. Elizabeth Gillett is such a talented artist and has so many styles, I also found some very pretty kimonos at Anthropologie and will share a few in the Shop the Post in case you are interested. Elizabeth does some private label designs for several retailers. I am seeing some fashion trends like polka dot and patchwork patterns. You would not have to pack a lot for your vacay, just add a white jean, tank, earring and wedge sandal. Ready, set and out the door. And don’t forget this sunnies!! Fashion is really an art form and I love sharing a talented artist like Elizabeth Gillett with you. I have visited her showroom in New York several times and she is delightful. A cancer survivor and dedicated mom, she is a joy to get to know. Every time I see one of her kimonos or scarves I am reminded of her hours of dedication to the art she produces and her contribution to the fashion industry. The behind the scenes stories of fashion designers are always the best and bring understanding to the customers in seeing the value of each garment . What a great third piece to complete your outfit in the summer months when you want to look pulled together but it is too hot for a jacket!! Plus I just love the colors!! 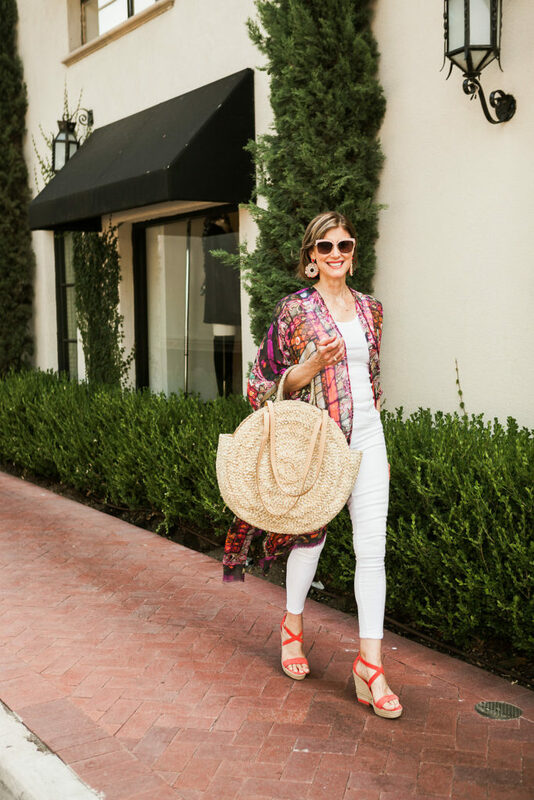 So fun and exciting and a scarf is a good way to bring flattering color up to your face.